So, MTA seems to store most of it's UI textures in .CBTEX files. It's definitely compressed data, but can it be decompressed? 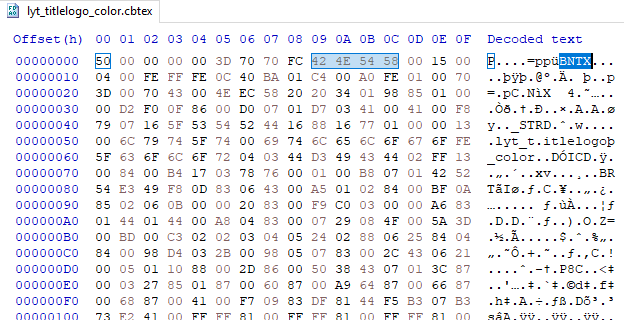 There is other compressed formats in the game(CBFMD, CBNTX etc etc), and there is a decompression script for them. But apparently these CBTEX files use different compression. Just thought i'd mention that too. sadly some of those texture files uses a different format that RTB is unable to figure out, just like the cubemaps since they're pretty much BNTX textures. How would we know if the format is different if the data is compressed? If the CBTEX stuff can't be decompressed, can the CBNTX and CBFMD files be re-compressed? As in different texture type that is unknown and not documented, so getting them to export properly isn't pretty much a top priority to researchers. there's no tool to re-compress or rebuild the files. Fun fact, 2.3.0 has a portion of deflate compressed CBTEX . It's waluigi_all_alb_l.cbtex and more.